I’ve made some tweaks to my standards-based grading. Last year I used a common four-point scale for each standard/concept. There are tons of other teachers using this structure, but it just didn’t have an impact on learning in my room. Two problems: I didn’t use the scale + my system for it was too complex. With the 1-4 scale, I found myself most concerned with students earning at least a 3 (proficient) on each standard. If they did, they earned “credit” for the standard. To calculate their final content grade, I divided the number of standards they earned credit on by the total number of standards assessed. 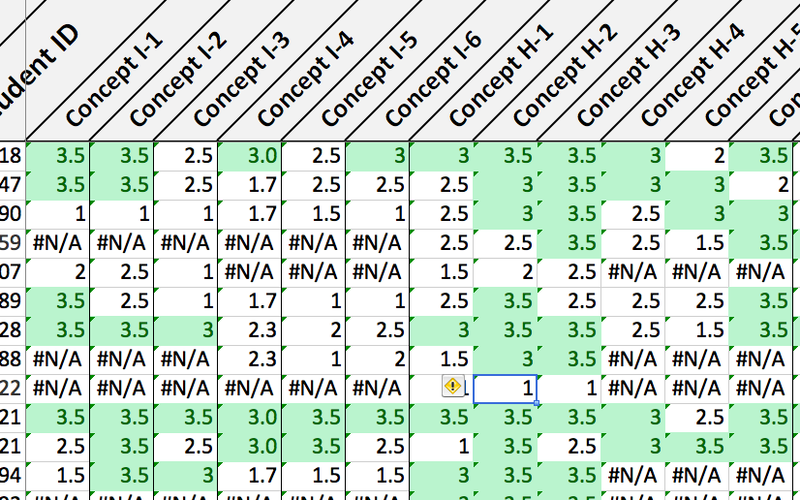 My SBG tracker (an excel spreadsheet) used the four-point scale, but because of how I calculated their final letter grade, my actual gradebook incorporated a two-point scale: 0 (no credit) or 1 (credit). This means that I was entering students’ progress twice: once for the SBG tracker and once for my actual gradebook. Add to this the tedious process of converting multiple choice responses (from scanned sheets) to scaled scores and averaging them with free response scores, and my SBG was, well, daunting. Not to mention overly cumbersome. I didn’t think about all this last year because I was primarily concerned with implementing SBG for the first time. I wanted it to be sound. I wanted it to be thorough. It was both of these things, but it was also far more complex than I needed it to be. I spent so much time implementing the system that I barely made use of all the SBG data I was collecting. I never strategized around my SBG data. I never harnessed it to better my students understanding of the concepts we studied. SBG is meaningless if teachers, students, and their parents don’t actively interact with, and grow from, its product. With all the said, I’m no longer using a four-point scale. I’m now on a 0 or 1 system. You got it or you don’t. If there’s no more than 2 computational errors and no conceptual errors in the solution, 1. If there’s one or more conceptual error(s) in the solution, 0. I’m using this for both my tracker and gradebook. 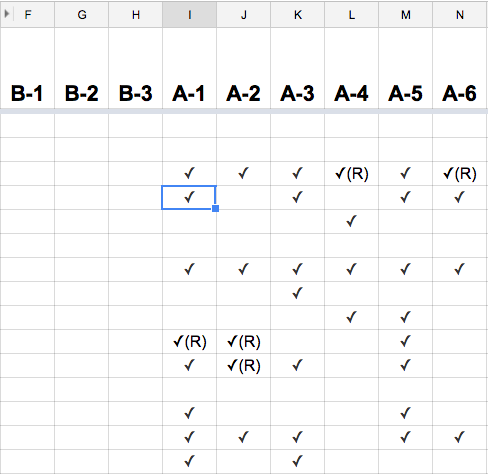 Plus, I’m using Google sheets now instead of Excel. I finally get to email SBG progress reports to both students and parents. I know this all-or-nothing scale eliminates the possibility of measuring those in-between areas, but by definition SBG provides a highly precise way of gauging student understanding since I’m measuring against individual standards. To me, it’s worth the slight sacrifice in precision if there’s more time and effort to act upon the results. And besides, how significant of a difference is a 2 compared to a 2.5? Or even a 1 compared to 2.5? Either way the student has not obtained proficiency, which is the ultimate goal. Since my course terminates in a high-stakes standardized exam, unit exams are my primary means of measuring attainment of standards. My exams are short (not new). There’s at most two questions related to any given standard (also not new). So this makes it even simpler to average out final scores using 0s and 1s. And since I’m providing answers to every question, I’m not scanning multiple choice questions and don’t need to manipulate the data all crazy to convert scores. I only grade work and explanations now, so after I examine the entire exam I determine whether each standard is a 0 or 1 and record it. I must be steadfast in getting students (and their parents) accustomed to retake exams. More importantly, they must learn to value retakes as a means of growth. There is now another teacher in my department using SBG. This will be a great resource to help make each other’s system better. Plus, now I can have regular conversations with someone about SBG face-to-face. Invaluable. Get students to take ownership of their results. Part of this will come from retakes and self-tracking, but another piece is dissecting their SBG grades in terms of computational and conceptual errors. This entry was posted in assessment and tagged sbg by brian. Bookmark the permalink.